Easy designer-look makeover for instant wow factor! There’s no denying lots of people love Ikea. I myself adore Ikea to the point of addiction, the children’s section is always great and there are so many bargains to be had. The only thing is with everyone loving Ikea, many of us end up with the same furniture. So this little table setting shows how to make Ikea the perfect blank canvas for expressing some easy DIY know-how. 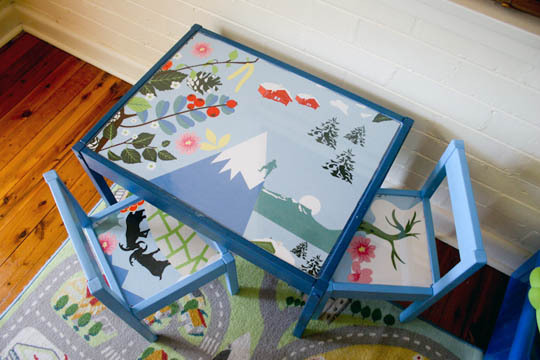 Sydney mum Emma bought the ever popular and inexpensive Ikea Latt table and chair set for her two-year-old son and really brought it to life with a few easy (believe me!) techniques. For her Latt set pictured here, she applied a couple of coats of paint on the table and chair frames, then used Ikea’s Annamoa fabric to create beautiful inserts on the chair seats and tabletop. These were then covered with sheets of acrylic that had been cut to size to protect the surface and for easy cleaning. Such a neat idea Emma and a perfect way to customise your furniture! The Ikea Latt table and chair set retails for $49 and the Ikea Annamoa fabric $14.95 per metre. Available from Ikea nationwide. Thanks to Jacqui for sharing this ingenious idea with us. We’d love to hear from other Babyology readers who have put their own personal stamp on otherwise plain furniture!